Down a side street, the Homy Inn is set in an urban tower block just a five-minute walk from East Tsim Sha Tsui metro station. Free Wi-Fi compliments this no-frills hostel’s highly convenient location. Compact dorms with bunk beds feature air-conditioning and shared bathrooms. Private rooms with en-suite facilities boast flat-screen TVs and tea/coffee-making equipment. Most rooms provide personal safes. Guests can make use of public-use computers and leave luggage at reception. Transport to and from the airport can be arranged for a fee. As well as a drinks machine, there is a communal fridge where visitors can store food and beverages. Numerous cafes, restaurants, takeaways and bars are located close by, including the ever-popular ‘Fatt’s Place’ at the end of the street. 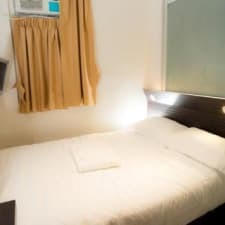 The Homy Inn is a five-minute walk from buzzing Nathan Road and a ten-minute stroll from Victoria Harbour’s spectacular views. Temple Street Night Market is a mile away. The vast majority of visitors staying here observed that all of the areas occupied by this hostel look smart, clean and freshly painted. Most travellers greed that the spotless - and very colourful - reception area looks particularly inviting. Surrounded by more eating, drinking and shopping options than seems possible, it's easy to see why so many visitors have been bowled over by this hostel's incredibly handy location. Must-see sights like the Avenue of Stars and Victoria Harbour are just a stroll away too, as is East Tsim Sha Tsui metro station. Numerous guests have been impressed by the proactive individuals who work at the hostel's reception desk. Evidently, these guys are the perfect people to address any concerns or questions that may come up during your stay. Nearly all of the visitors who've stayed at his hotel have remarked on the ultra-compact accommodations offered here. The en-suite bathrooms are incredibly small too. Many travellers have been less-than-impressed by the free Wi-Fi offered here as it requires users to go through a convoluted logging-on process via a web page. Unfortunately, it has a habit of periodically disconnecting, thereby forcing users to go through the whole process again. If you're on the third floor and you want to go up and see your friend on the fifth floor, you'll have to go down to the ground floor in one lift (the ‘descend-only' one) and then go up to the fifth in another (the ‘ascend-only' one). Unsurprisingly, very few visitors appreciated this set-up.